The company of The Watsons. Photo © Manuel Harlan. ‘Those first angular chapters of The Watsons prove that hers was not a prolific genius’, wrote Virginia Woolf in The Common Reader. Yet, despite the perceived ‘stiffness and bareness’ of the ‘in the main inferior story’, Woolf detected in this early unfinished fragment all the elements of Jane Austen’s greatness. 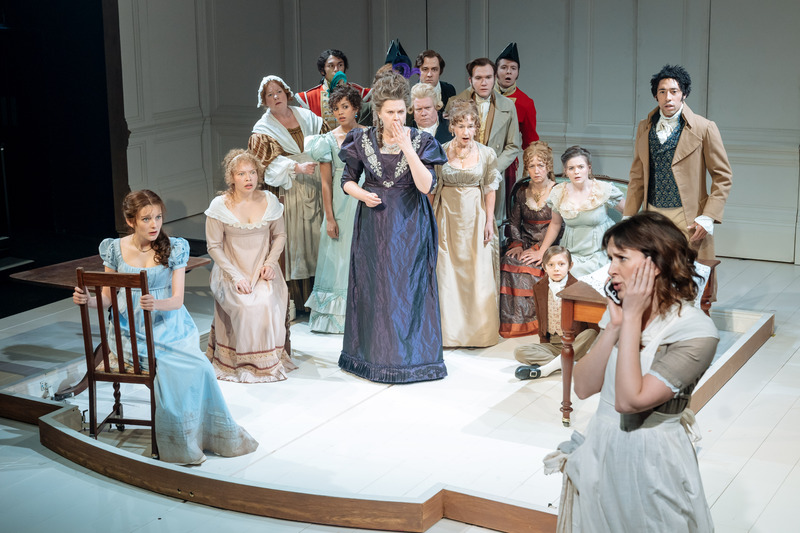 There are certainly plenty of Austen-like comic touches in Laura Wade’s treatment of Jane Austen’s unfinished novel, performed at the Chichester Festival theatre last year. The imperious Lady Osborne (Jane Booker) who has been ‘blissfully widowed’ for many years, and the arriviste sister-in-law from Croydon, Mrs Robert Watson (Sophie Duval), had the Minerva audience laughing out loud. Yet, director Sam West’s production had a wistful undercurrent from the outset, beautifully accented in Isobel Waller-Bridge’s haunting score. West opens the play on a scene which at first sight seems like familiar Austen territory. Here is the Stanton parsonage parlour inhabited by the genteel, unmarried, daughters of the rector; the whole scene a recognisable Austen evocation of civilized domesticity and unshakeable rural gentility. However, the threat of dispossession that stalks the unfinished novel lies at the heart of this production too, symbolized by the death-bed tableau opening and closing the play. The rectory is home to the Watson sisters only as long as the bed’s invalid incumbent, the Reverend Watson, lives. The widow Mrs Bates and her daughter, the well-meaning but garrulous Miss Bates, in Emma suffered a similar fate, watching from their cramped lodgings as the insufferable Eltons take over their former vicarage home. ‘She is poor’, Mr Knightley reminds Emma after her cruel treatment of Miss Bates at the Boxhill picnic, ‘she has sunk from the comforts she was born to and, if she live to old age, must probably sink more’. Emma Watson is no Miss Bates, but, unlike Austen’s other heroines, whose personal trajectories are upwards, morally, socially and romantically, Emma Watson is sliding the other way. After 14 years living in expectant comfort with a wealthy elderly aunt in Shropshire, Emma must now face a different life back ‘home’ in genteel poverty at Stanton parsonage. There is perhaps much of Austen the parson’s daughter in the depiction of the plight of Emma Watson. In 1800, and without warning, according to the Memoirs of James Edward Austen Leigh, the Reverend George Austen announced to his daughters they were leaving home; the new incumbent at Steventon Parsonage was to be Austen’s brother James and his acquisitive wife Mary. Austen is said to have fainted with shock at the news and later remarked in a letter to Cassandra, ‘the whole World is in a conspiracy to enrich one part of our family at the expense of another’ (Letters, 88). This was a bleak, unsettled time for Austen as the family moved between lodgings in Bath. Her close confidante Anne Lefroy died in 1804 and George Austen died in early 1805, taking with him any financial cushion of a clerical pension. It was in this desolate atmosphere that Austen was working on The Watsons, and the play opens in October 1803. With such an uncertain future, a parson’s daughter needed to marry, and marry well; a stark economic necessity rather than romantic wish fulfilment which Wade’s production did not shy away from. The pared-down language of the unfinished novel, textually incised to a degree unknown in her other manuscripts, is given visual expression in the pared down staging with its architectural door and window frames suggesting enclosure rather than opportunity for the Stanton parsonage inmates. None of Emma’s three marriage prospects – her only practical means of escape from impending penury and homelessness – the aristocrat, the cleric, or the Wickham-type bounder, are attractive propositions. They represent, however, the bleak choice facing Emma Watson; one that remains unresolved as the narrative energy drains away in this unfinished fragment, leaving Emma marooned in the silence of her father’s sick room. It is at this moment in the play, just as Emma appears about to settle for the wealthy yet emotionally stunted Lord Osborne, that a writer from our own time, Laura, enters stage left with a heartfelt ‘Noooooooooo’. The intervention turns the play on its head giving it a palpable energy and dramatic life that are entirely its own. As the boundaries between writer and characters, fact and fiction are crossed and re-crossed, the plot is wrested out of Laura’s hands. The characters mutinously attempt to take control of their own narratives, rejecting the contemporary intruder’s suggestions and dramatically exploring to what extent a character can take on a life of its own. There is an acknowledged echo of Pirandello’s Six Characters in Search of an Author, yet this does not detract from the originality of this production. Wade brings inter-textual lives into dramatic focus as Austen’s characters resist their allotted parts in revolutionary style. In this energetic, confident production, shared modern and eighteenth-century anxieties are set against a bleached Georgian paneled backdrop; enlightenment debates of self-determination surrounding Rousseau and Locke are intertwined with contemporary existential concerns about the locus of authority and the role of the author. ‘What would Jane Austen have done?’ asks Laura, faced with such dramatic rebellion from her characters. The tyranny of any novel is such that it demands an ending, and so does the play. After all, as Laura bemoans, ‘People have bought tickets’. What makes this adaptation so original is that any expectation of Austen pastiche has been replaced by something much more thought-provoking: a fellow writer’s look at authority, authorship and the art of an ending. A play of this calibre deserves to reach a wider audience; look out for it. In the meantime Wade’s acclaimed production of Home, I’m Darling (transferred from a sell-out run at the National) is playing at the Duke of York’s theatre until 13th April 2019. The Watsons, adapted from Jane Austen by Laura Wade, and directed by Samuel West, was at the Minerva Theatre, Chichester, from 3 November to 1 December 2018.